At that time, Eliminate-Obstructions Bodhisattva said to the Bhagavan: "We have already heard from the Buddha about the past deeds of Avalokitesvara Bodhisattva. Then, what Dharma-Gates of Samadhi does that Bodhisattva have? Bhagavan, please expound for us." The Buddha said: "Virtuous man, the Dharma-Gates of Samadhi that he has are called: With-Shapes Samadhi, No-Shape Samadhi, Vajra-Creation Samadhi, Sunlight Samadhi, Vastness Samadhi, Sublime Samadhi, Banners and Flags Samadhi, Sublime Producing Samadhi, Sublime King Samadhi, Illuminating the Ten Directions Samadhi, Wonderful Eyes and Wishes Fulfilling Samadhi, Dharma Holding Samadhi, Wonderful Uppermost Samadhi, Love Giving Samadhi, Vajra-Flag Samadhi, Discerning All Worlds Samadhi, Joyous Well Gone One Samadhi, Supernatural Power Karma Samadhi, Buddha Summit Wheel Samadhi, Wonderful Eyed Moon Samadhi, Understanding Many Relatives Samadhi, Heavenly Eye Samadhi, Brilliantly Shining Kalpa Samadhi, Transforming and Manifesting Phenomena Samadhi, Lotus Superior Samadhi, Superior King Samadhi, Purifying Avichi Samadhi, Faith Characters Samadhi, Heavenly Wheel Samadhi, Refreshingly Cool Dew Sprinkling Samadhi, Wheel Light Samadhi, Ocean Depth Samadhi, Plenty of Palaces Samadhi, Kalavinka Sound Samadhi, Green Lotus Fragrance Samadhi, Conveying Samadhi, Vajra-Armor Samadhi, Eliminates Worries Samadhi, Lion Walk Samadhi, Unsurpassed Samadhi, Subduing Samadhi, Wonderful Moon Samadhi, Light Shining Samadhi, Hundreds of Light Samadhi, Flaming Light Samadhi, Brilliance Karma Samadhi, Marvelous Attributes Samadhi, Persuading Asura Samadhi, Palaces Samadhi, Manifesting Nirvana Samadhi, Great Lamp Light Samadhi, Lamp Light King Samadhi, Saving Transmigration Samadhi, Literal Using Samadhi, Gods Appearing Samadhi, Corresponding Karma Samadhi, Experiencing the True-Thus Samadhi, Electric Light Samadhi, Dragon Sublime Samadhi, Lion's Rousing Samadhi, Sadhimin Samadhi, To And Fro Samadhi, Awakening Transformation Samadhi, Mindfulness Root Growing Samadhi, Formless Liberation Samadhi, Supremacy Samadhi, Enlightening Samadhi." 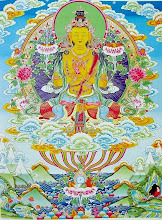 "Virtuous man, Avalokitesvara Bodhisattva Mahasattva has not only these Samadhis. In each of his hair pores, there are hundreds of thousands of ten thousands of Samadhis. 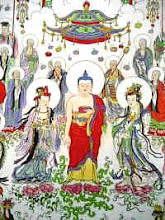 Virtuous man, Avalokitesvara Bodhisattva Mahasattva, as a Bodhisattva, has such merits and virtues, even the Buddhas, the Tathagatas also highly praise that such merits and virtues are unprecedented." "Virtuous man, once in the past, when I was a Bodhisattva, I and five hundred merchants wished to go to Lion state, to trade our vehicles, pack horses, camels, cattle, and so on. for their treasures. We prepared the goods and set out, passed along villages, encampments, cities, states, and hamlets, and then we arrived at a shore and intended to embark. Having gotten on a Kusing ship, I asked the ship owner: 'Could you observe the direction of the wind, from which direction did it come? Which direction is it going to? Is it blowing towards Treasure continent, Jva state, or Raksa country? The ship owner then observed the direction of the wind, and said: 'Now by this wind we can get to Lion state.' Thereupon, we went by the wind towards Lion state." "In that state, there were five hundred Raksa women, who suddenly created a violent windstorm. The windstorm created violent waves and destroyed the ship, and made those merchants fall into the water. By floating and swimming, the merchants finally reached the shore and went onto the land. Having seen those merchants, the five hundred Raksa women shook their bodies severally and made horrible sounds. They transformed into girls and came to where the merchants were, and gave some clothes to the merchants. The merchants then wore those clothes, twist their wet clothes and exposed them to the sun to make them dry, and left that place, went to a Campaka tree and rested under it. When resting, they said to each others: 'Now what can we do? We are at the end of our wits.' and then became silent. At that time, the Raksa women came in front of the merchants again, saying: 'We have no husband, could you be our husbands? In our places, we have drinks, foods, clothes, reserves, gardens, and bath pools.' Then, each of those Raksa women brought one merchant to her home." 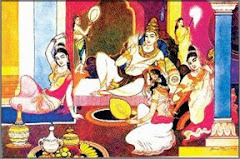 "Among the Raksa women, there was a woman called Tigalam, who was the great master. She brought me to her home, and offered me superior delicious drinks and foods. I ate my fill and became satisfied, feeling that I was as happy as when I was in human worlds. Having stayed in there for 42 days, suddenly, I saw the Raksa Tigalam smiled agreeably. I then became suspicious of it - for I had never seen or heard that before. So, when the Raksa woman was smiling in such a manner, I asked: 'Why are you now smiling like this?' The Raksa woman said: 'This Lion state is the home of Raksa women, I am afraid that you will be killed.' I asked: 'Why do you know it?' The Raksa woman said: 'Do not step into the way to the south, because there is an iron castle, which has no door on anywhere of it. Inside it there are innumerable merchants, many of whom have been eaten, with only the bones left. Now you see the living people so you would not believe that, you may follow that way to there, then you will believe me.'" "Thereafter, I waited till the woman fell asleep, at the midnight, I went to the south, with a moonlight sword holding in my hand. When I got to the iron castle, I walked around it and looked about, but could not find any door or window. Beside that iron castle, there was a Campaka tree. I climbed up the tree and called out loudly. The merchants in the iron castle then replied to me: 'Worthy great merchant master, do you know that, we are imprisoned in this iron castle by the Raksa women, they eat one hundred of us every day!' and then they stated the past things in detail. Having heard that, I went down from the Campaka tree, follow the original way and quickly went back the Raksa woman's home. The woman asked me: 'Worthy great merchant master, have you seen the iron castle that I mentioned? You should tell me honestly now.' I said: "I have seen it", and went on to ask the woman: 'By which means can I leave this place?' the Raksa woman then told me: 'There is a great means, which can make you gain peace and rest, bring you out from this Lion state, to return to the southern continent Jambudvipa.' Hearing that, I asked that woman again: 'How can I leave this state?' The Raksa Tigalam told me: 'There is a Holy(Arya) Horse King, who can save and ferry all sentient beings.'" "Afterwards, I caught an opportunity and went to where the Holy Horse King was. At that time he was eating White Medicine Herbs. After eating, he rolled on the gold sanded ground, and then stood up, shook the hair on his body, and said: 'Who wishes to get to the other shore?' He repeated three times and went on: 'Anyone who wishes to go should say it himself.' Then I said to the Holy Horse King: 'Now I wish to go there.' Having said that, I returned to the Raksa woman's home and went to sleep." Then, when the Raksa woman awakened from her sleep, she became regretful and asked me: 'Merchant master, why is your body so cold?' I knew that she did not want me to go, thus I said to the woman with an excuse: 'Just now I have been out of the city for a while, and then returned, therefore my body is cold.' The woman then said to me: 'Sleep then.'" "I slept until the sun rose, and then called the merchants together: 'Now it is the time to go outside of this city.' Then, the merchants all went out of the city, got together at a place to rest, and said to each others: 'Now, in the midst of us, whose wife loves him most? What did he see? And how are things going?' Thereupon, someone in the crowd said: 'She offers superior delicious drinks and foods to me.' Some other said: She offers various clothes to me.' Some other said: 'She offers heavenly crowns, ear-ornaments, and clothes to me.' Some other said: 'I gained nothing but dissatisfaction.' 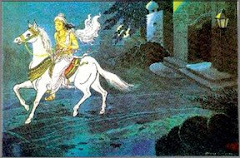 Some other said: 'She offers me various fragrances of dragon, musk, and sandalwood.' After the merchants had said that, I told them: 'You are now in trouble and should seek for liberation, how come you be attached to the Raksa women?' Having heard that, the merchants were frightened. They asked: 'Great merchant master, is it true?' I then told them: 'This Lion state is the home of Raksa women. They are not human beings, but Raksa women.' and swore: 'The Buddhas, the Dharmas, and the Sanghas can know that they are Raksa women.' The merchants then said to me: 'By which means can we be free from this misfortune?' I told them: 'In this Lion state there is a Holy Horse King, who can save all sentient beings. Once when he had eaten great White Medicine Herbs, rolled on the gold sanded ground, and then stood up, shook his body and said three times: 'Who wishes to get to the other shore?' then I had told the Horse King that I wish to get to the other shore.' The merchants asked again: 'So, at which day should we go?' I told them: 'Three days later, we must go. We should prepare materials and foodstuffs.' After the conversation, we went back into the city, and returned severally to the Raksa women's home." "When the woman saw that I was returned, she inquired after me: 'Are you tired now?' I asked the Raksa woman: 'I have not seen your joyful gardens and bath pools, do they really exist?' The Raksa woman told me: 'Great merchant master, there are various joyful gardens and bath pools in this Lion state.' I said to her: 'Then please prepare some materials and foodstuffs for me, I wish to go on a tour of those various gardens, pools and swamp, and view the famous flowers, and then I will come back home with various flowers.' The Raksa woman then said to me: 'Great merchant master, I will prepare materials and foodstuffs for you.' 'If the Raksa woman knows my stratagem, she will surely kill me." Thinking of this, I kept silence." 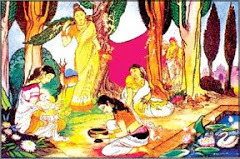 "Then, The Raksa woman prepared some fine drinks and foods and asked me to eat. After eating, I sighed. The woman asked: 'Great merchant master, why did you sigh like that?' I then told the woman: 'I was originally a people of Southern continent Jambudvipa, I miss my homeland.' The woman said to me: 'Great merchant master, do not miss your homeland. In this Lion state, there are various drinks, foods, clothes, reserves, various joyful gardens and bath pools, you enjoy myriads of happiness here, how come you miss the Southern continent Jambudvipa?' I then kept silence." "In the second day, the woman had prepared drinks, foods and materials for me, the other merchants had also prepared their materials and foodstuffs, and were waiting for the third day." "At the third day, when the sun just rose, we all left the city. Outside the city, we discussed together: 'Now we should leave quickly, and should not look back on the Lion sate.' After these words, the merchants and I ran quickly towards where the Holy Horse King was. Having reached there, we saw that the Horse king was eating the herbs. After the eating, he arose, and shook the hair on his body. At that time, all the ground of Lion state became quaky. The Horse King asked three times: 'Now who wish to go to the other shore?' The merchants said: 'We now wish to go to the other shore.' The Holy Horse King shook his body and said: 'You all should go forth, do not look back on the Lion sate.' After the Holy Horse King had said that, I climbed onto the Horse King first, and then the five hundred merchants also climbed onto the horse." "At that time, the Raksa women in Lion state suddenly heard that the merchants had left, they made heartbroken sounds, and ran out to pursue. Crying out sorrowfully, they went after the merchants. Having heard the sound, the merchants looked back, and then fell off unconsciously. Their bodies fell into the water, and then the Raksa got them and ate the fleshes of their bodies. Thereupon, only one person--myself went on going towards Southern continent Jambudvipa." "When the Holy Horse King reached the shore, I got off from him, circumambulated the Holy Horse King three times, and left. Then, I found the road to my original home and walked on, and finally arrived my home. When my parents saw that I was returned, they hugged me delightedly, and then wept sorrowfully. Because of this, my parents' eyes, which had become dim because they had been weeping constantly with tears for me, were recovered and became as bright as before. At that time, when both the parents and the son were together, I told them in detail the past hard things that I had undergone. After hearing that, my parents said to me: 'You can save your life and come back safely today, it really comforts us, so we are no longer worried. We do not need the treasures that you earned. Since we know that we are old and weak now, we need you to support us with hand, to help us in and out. We are going to die, and you will be the host and will send off and bury our bodies.' The parents of my past lifetime had said those words to comfort me. Eliminate-Obstructions, at that time when I was a merchant master, I had undergone such dangerous and worrying things." The Buddha told Eliminate-Obstructions Bodhisattva: 'The Holy Horse King at that time, was Avalokitesvara Bodhisattva Mahasattva indeed, who had saved me from the danger and the fear of death. 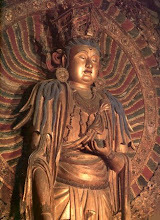 Eliminate-Obstructions, now I cannot speak in detail about the merits and virtues of Avalokitesvara Bodhisattva Mahasattva, so I just speak briefly about the merits and virtues of the hair pores on the body of Avalokitesvara." "Eliminate-Obstructions, on the body of Avalokitesvara Bodhisattva, there is a Gold hair pore, inside which there are innumerable hundreds of thousands of ten thousands of Gandharvas. They do not suffer from transmigration, but are always enjoying the supreme bliss. The heavenly substances for their uses are limitless. They are free from the mind of evil, hate, and jealousness, and have no greed, anger or ignorance. 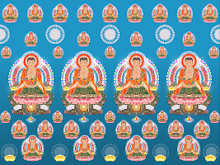 They constantly practice the noble eightfold path, and are always enjoying the Dharma-Joy. Eliminate-Obstructions, in this Gold hair pore, there is also an illuminant Wish-fulfilling precious pearl, which fulfills all the needs of those Gandharvas according to their wishes. Inside that Gold hair pore, the things are thus." "Moreover, there is a Black hair pore, inside which there are innumerable hundreds of thousands of ten thousands of kotis of nayutas of immortals (rsi) who have supernatural powers. Some of them have one kind of supernatural power; some of them have two, three, four, or five supernatural powers; and some of them have fully the six supernatural powers. Inside that hair pore, there is also a silver ground with a gold mountain on it. 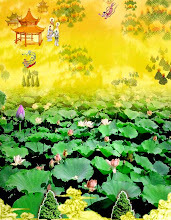 The peak of the mountain is made of silver, and 37 Love-Defiled Lotus treasures are adorning the mountain. Inside that mountain, there are 84 thousand immortals (rsi). Besides the place of those immortals, there are some kalpataru trees, with the trunks of deep red, and the branches and leaves made of gold or silver. The trees are emitting precious light." "On each side of the hair pore, there are pools of the four treasures, filled with the waters of the eight merits and virtues. Inside the pools, there are full of wonderful flowers. Beside the banks of the pools, there are heavenly wonderful fragrant trees, and Sandalwood fragrant trees. There are also many sublime kalpataru trees, with sublime heavenly crowns and ear-ornaments hanging over them, which are adorned with especially wonderful precious necklaces. 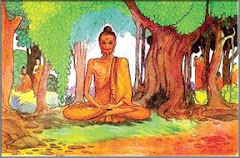 Hanging over those trees, there are also many precious bells, wonderful garments, and Kausika clothes. Under each of those kalpataru trees, there are one hundred Gandharva kings, who constantly perform various music. There are also droves of deer and inspired birds, who ponder when they hear the music: 'Most sentient beings are suffering from transmigration, why do the people in Southern continent Jambudvipa see and suffer from the afflictions such as birth, aging, illness, death, being separated from the persons or things that they love, and so on?' These birds and deer then think of the name of this Mahayana Sublime Treasure King Sutra, thereupon, many heavenly superior delicious drinks and foods, heavenly wonderful fragrances, heavenly wonderful clothes, and so on, will appear and satisfy them, according to their wishes." Eliminate-Obstructions Bodhisattva then said to the Bhagavan: "What I heard just now is really rare, Bhagavan." The Buddha said: 'Virtuous man, what do you think then?" Eliminate-Obstructions Bodhisattva said to the Bhagavan: 'Only by being mindful of the name of this sutra, those sentient beings can gain such benefits, peace and happiness, if anyone can hear this sutra, can also write, uphold, read, recite, make offerings to, and honor this sutra, such a person will always in peace and happiness. If any other one can writes even one word in this sutra, he will be free from the sufferings of transmigration, will never be reborn in the families of the inferior classes such as butchers, slaughterers, or the like. The bodies that he will be reborn in will never have the diseased or unhappy aspects such as hunched back, crooked feet and hands, lame leg, ugly lip, disfigurements, scabies, leprosy, and so on. The bodies that he will get will have perfect appearance, with all the faculties(indriya), and great strength. How much more so, of the merits and virtues gained by those who fully uphold, read, recite, write, make offerings to, and honor this sutra!" The Bhagavan then praised: "Good indeed, Good indeed, Eliminate-Obstructions. You are so virtuous that can speak such Dharma. Now in this congregation, the innumerable hundreds of thousands of ten thousands of gods, dragons, Yaksas, Gandharvas, Asuras, Garudas, Kinnaras, Mahoragas, human and non-human beings, Upasakas, Upasikas, and so on, have all heard the Dharma that you spoke. They also got to hear this extensive Dharma-Gate because of your questions." Eliminate-Obstructions Bodhisattva then said to the Bhagavan: "Bhagavan, now please go on to speak this wonderful Dharma, to make the assembly of gods, humans and so forth all arouse the unbreakable faith." The Bhagavan then praised: "Good indeed, Good indeed, Virtuous man, you can ask repeatedly in such a way, about the merits and virtues manifested inside the hair pores on the body of Avalokitesvara. Eliminate-Obstructions, there is also a Treasure Sublime hair pore, inside which there are innumerable hundreds of thousands of ten thousands of kotis of nayutas of Gandharva women, who have beautiful faces and good and wonderful figures, adorned with various ornaments. Their appearances look like heavenly goddesses. They are immune from the afflictions of greed, anger and ignorance, and their bodies do not suffer from even the least afflictions or worrying of the human world. 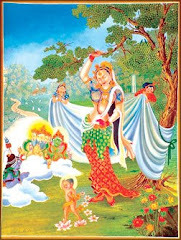 Those Gandharva women recite the name of Avalokitesvara Bodhisattva Mahasattva at the three times(*) of the day, then they get all the necessities they desire." Eliminate-Obstructions Bodhisattva then said to the Buddha: "Bhagavan, I wish to enter into the hair pores to see the things inside." The Buddha said: "Virtuous man, his hair pores have no boundary, just like the space realm, which has no boundary. Virtuous man, such hair pores have neither obstruction nor the trouble of collision. If Samanta-bhadra(Universal Goodness) Bodhisattva Mahasattva enters into and roams within one of those pores for twelve years, he still cannot reach the boundary of it. 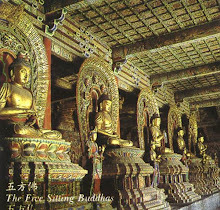 Inside each hair pores, he sees that there are Buddha-Units(kulam) dwelling, this is why Samanta-bhadra cannot see the boundaries and distances of the pores. So, how can other Bodhisattvas be able to see the boundaries of them?" Eliminate-Obstructions Bodhisattva then said to the Buddha: "Bhagavan, if Samanta-bhadra Bodhisattva Mahasattva roams within a pore for twelve years but still cannot see its boundary, and there are one hundred Buddhas inside each of those hair pores, since even Samanta-bhadra Bodhisattva Mahasattva cannot get to see the boundary, how can I be able to do it?" The Buddha said: "Virtuous man, I just do not see such delicacies, wonders and quietude. The Bodhisattva, who is formless actually, manifests the vast body, which has eleven faces, and hundreds of thousands of prefect and great eyes. He had attained the corresponding stage, which is crystal clear and calm. He is greatly wise, and is free from gain and transmigration; He does not see the beings that he saves,(* Seeing is actually a leaking of energy. 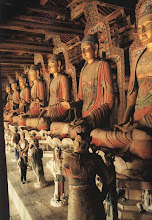 The Buddhas are non-leaking and motionless, thus they do not see or speak actually. They just manifest that they are doing many things.) and des not discriminate their races; He is free from wisdom and speaking -- all the phenomena, are just like shadows and echo. 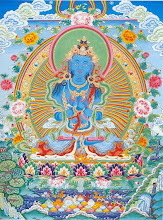 Virtuous man, Avalokitesvara Bodhisattva Mahasattva is free from seeing, hearing, and is free from the Self-Nature, even the Tathagatas are unable to read his mind. Virtuous man, Samanta-bhadra and the other Bodhisattvas, who have unimaginable abilities, also cannot fully know all the transformations and manifestings done by the Avalokitesvara. 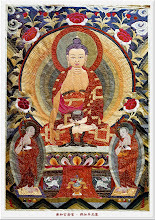 Virtuous man, Avalokitesvara Bodhisattva Mahasattva manifests myriads of things to save and ferry innumerable hundreds of thousands of kotis of nayutas of sentient beings, makes them be reborn in Utmost Bliss World, see the Infinite-Life Tathagata, get to hear the essential of the Dharma, and achieve the Bodhi Way." Eliminate-Obstructions Bodhisattva then said to the Bhagavan: "I wonder, by which means can I see the Avalokitesvara Bodhisattva Mahasattva?" The Buddha said: "Virtuous man, that Bodhisattva will come to this Saha World for sure, to see me, pay respect to, and make offerings to me." Eliminate-Obstructions Bodhisattva then said to the Buddha: "Bhagavan, do you know when will this Avalokitesvara Bodhisattva Mahasattva come?" The Buddha said: "Virtuous man, when the roots of the sentient beings in this world are mature, that Avalokitesvara Bodhisattva Mahasattva will come here." Then, Eliminate-Obstructions Bodhisattva Mahasattva supported his cheek with a hand and thought: "How come I have such sins and obstructions, that although my lifespan is long, I cannot have the benefit, of seeing the Avalokitesvara Bodhisattva, to respectfully do obeisance to him? I am just like a blind person walking on a road." Eliminate-Obstructions Bodhisattva then asked the Buddha again: "Bhagavan, when will that Avalokitesvara Bodhisattva Mahasattva come, exactly?" The Bhagavan then smiled and said: "Virtuous man, the time of the coming of Avalokitesvara Bodhisattva Mahasattva, is timeless." "Virtuous man, on the body of that Bodhisattva, there is also a hair pore called Sweet Dew Sprinkling. Dwelling inside this hair pore, there are innumerable hundreds of thousands of ten thousands of kotis of nayutas of heavenly people, who have attained the first Bhumi(stage), the second Bhumi, and up to the position of Bodhisattva Mahasattva of the tenth Bhumi. Eliminate-Obstructions, inside that Sweet Dew Sprinkling hair pore, there are sixty precious mountains made of gold and silver. Each of those mountains is 60 thousand yojana in height, has 99 thousand peaks, and is adorned with heavenly wonderful gold and treasures around it. And, dwelling in them, there are many Bodhisattvas, who will become Buddhas in their next lifetimes." "Further more, innumerable hundreds of thousands of ten thousands of kotis of nayutas of Gandharvas are constantly performing music inside that hair pore." "Eliminate-Obstructions, inside that Sweet Dew Sprinkling hair pore, there are also hundreds of thousands of ten thousands of kotis of nayutas of palaces, adorned with heavenly Mani wonderful treasures around, and decorated with myriads of pearls and necklaces. These make the people who see them feel comfortable. Inside those palaces, there are Bodhisattvas who speak delicate and wonderful Dharmas, and then go outside of the palaces and walk around severally. Within the Walking (cankramana) areas, there are 77 pools, filled with the waters of the eight merits and virtues. Inside those pools, there are full of various flowers, such as Utpala flowers, Padma flowers, Kumuda flowers, Pundarika flowers, TsoGhandaka flowers, Mandara flowers, and Maha-Mandara flowers. Within the Walking-Areas, there are also some pleasing kalpataru trees with their leaves made of heavenly gold and silver, adorned with heavenly crowns, ear-ornaments, rare Jewels, necklaces, and other various treasures hanging over them. 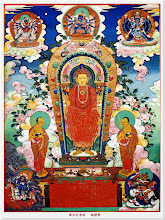 Having walked around, at night, those Bodhisattvas recall various Mahayana Dharmas, ponder on the stage of the still quiescence, and ponder on the inferior reincarnations such as hell, hungry ghost, and so forth. Having pondered in such a way, they then enter into the Merciful Heart Samadhi. 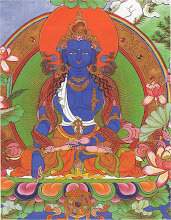 Eliminate-Obstructions, inside that hair pore, there are such Bodhisattvas." "Further more, there is a hair pore called Vajra-face, inside which there are innumerable hundreds of thousands of ten thousands of Kinnaras. They adorn themselves with various flower-wreaths all over their bodies, and apply wonderful paste-fragrance on their bodies, everybody who sees them feels happy. They are constantly mindful of the Buddhas, the Dharmas, and the Sanghas, have attained the unbreakable faith, and are staying in the Dharmas, the forbearances, and the mercies. They ponder on the still quiescence, and are far away from transmigration. In such a way, virtuous man, those Kinnaras arouse joy from their hearts. Within that hair pore there are innumerable mountains, inside which there are diamond(Vajra) precious caves, gold precious caves, silver precious caves, Sphatika precious caves, Lotus colored precious caves, and Green precious caves. There are also some caves that fully have the seven treasures. Thus, virtuous man, inside that hair pore there are such manifestations." "Moreover, inside it there are innumerable kalpataru trees, innumerable sandalwood great trees, and delicate wonderful fragrant trees. Appearing inside it, there are also innumerable bath pools, hundreds of thousands of ten thousands of heavenly precious palaces, and the masterly pure and pleasing precious palaces adorned with Sphatika. Such palaces are the dwelling and resting places of the Kinnaras. Having rested, they speak the delicate and wonderful Dharmas, such as the Dharma of Donating Paramita, and the Dharma of precepts keeping, forbearance, diligence, Dhyana, and Prajna Paramita. Having spoken these six Paramitas, they then walk around individually. In that area, there are gold walking (cankramana) paths and silver walking paths, around which there are kalpataru trees with their leaves made of gold and silver, adorned with various heavenly garments, precious crowns, ear-ornaments, precious bells, and necklaces hanging over them." "In the Walking (cankramana) areas, there are also some pavilions, within which some Kinnaras are walking, pondering on the suffering of being submerged in the repetition of birth, aging, illness, and death, the suffering of poverty, the suffering of being separated from the persons or things that one loves, the suffering of being associated with the persons or things that one dislikes, the suffering of being unable to obtain what one desires, the suffering of falling into the Stung-by-Needles hell, Black ropes hell, Pickles drinking great hell, Extremely hot great hell, or Fire pits hell, and the suffering of falling into the reincarnation of hungry ghost, and so forth. Those Kinnaras ponder on the great afflictions that such sentient beings suffer from. 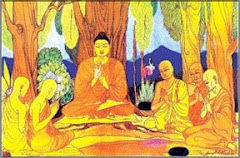 Moreover, virtuous man, those Kinnaras enjoy the extremely profound Dharmas, ponder on the true realm of the perfect quiescence (parinirvana), and are also constantly mindful of the name of Avalokitesvara Bodhisattva Mahasattva. Because of the mindfulness and reciting, they immediately gain all the materials and appliances that they need." 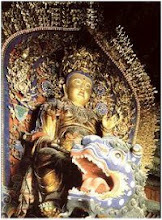 "Virtuous man, even the name of Avalokitesvara Bodhisattva Mahasattva is difficult to encounter. Why? Because he donates to all sentient beings like their great parent, gives fearlessness to all the frightened sentient beings, and acts as a great virtuous friend of all sentient beings to enlighten and lead them." "Virtuous man, that Avalokitesvara Bodhisattva Mahasattva has a Six-Words-Great-Enlightening-Dharani, which is difficult to encounter. If anyone can recite or be mindful of the name of it, he will be reborn in the hair pores of the Bodhisattva instead of sinking into transmigration, and, when he leaves a hair pore, he will then proceed to another hair pore and live within it. He will go on in such a manner, till he attained the stage of the perfect quiescence." Eliminate-Obstructions Bodhisattva then asked the Bhagavan: "Bhagavan, where is this Six-Words-Great-Enlightening-Dharani gained from?" 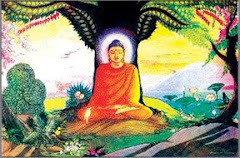 The Buddha said: "Virtuous man, this Six-Words-Great-Enlightening-Dharani is difficult to encounter, even the Tathagatas also do not know where it is gained from, how can the Bodhisattvas in Cause-Stage know that?" Eliminate-Obstructions Bodhisattva said to the Bhagavan: "For such a Dharani, how come the Buddhas, the Tathagatas, Arhats, Samyak-sambuddhas do not know that?" The Buddha said: "Virtuous man, this Six-Words-Great-Enlightening-Dharani is the delicate and marvelous essential heart of Avalokitesvara Bodhisattva Mahasattva, if anyone knows this delicate and marvelous essential heart, it is the same as knowing the liberation." Eliminate-Obstructions Bodhisattva then asked the Bhagavan: "Bhagavan, are there any sentient beings able to know this Six-Words-Great-Enlightening-Dharani?" The Buddha said: "There is no one who can know it. Virtuous man, even innumerable corresponding Tathagatas can hardly know, how can the Bodhisattvas know this delicate and marvelous essential heart of Avalokitesvara Bodhisattva Mahasattva? I had been to many worlds of other directions, but no one in those worlds knows this Six-Words-Great-Enlightening-Dharani. If anyone can constantly accepts and holds this Six-Words-Great-Enlightening-Dharani, whenever he holds and recites it, 99 Ganges-river-sands Tathagatas gets together, the Bodhisattvas as many as atoms of universe also gets together, 32 gods also gets together, and the four heavenly kings guards in the four directions for him. Innumerable hundreds of thousands of ten thousands of kotis of nayutas of dragon kings, such as Sagara dragon king, No-affliction-of-hot dragon king, Techaga dragon king, Vasuki dragon king, and so on, also comes and guards this person; and the Yaksas inside the earth, the deities in the space, and so on, also guards this person." 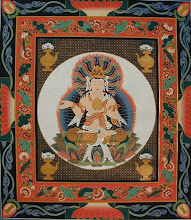 "Virtuous man, the kotis of Tathagatas, who dwell within the hair pores on the body of Avalokitesvara Bodhisattva, will praise this person: 'Good indeed, Good indeed, virtuous man, you can gain this wish-fulfilling Mani treasure, your seven generations of ancestors will all attain the liberation.' Virtuous man, for that person who holds this Dharani, all the worms inside his stomach will achieve the stage of non-retrograde Bodhisattvas. 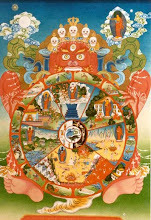 If there is any other person who wears this Six-Words-Great-Enlightening-Dharani on his body or neck, virtuous man, seeing this Dharani-wearing person is the same as seeing the Vajra body, also like seeing sharira and Stupa, also like seeing the Tathagata, also like seeing the person who has one-koti wisdoms. If there is any virtuous man or virtuous woman, who can be mindful of this Six-Words-Great-Enlightening-Dharani according to the Dharma, this person will obtain the limitless eloquence, will gain the pure wisdom, and will gain the great mercy and compassion. Such a person can, every day, fully accomplish the merits and virtues of the six Paramitas. This person will gain the Summit-Infusion (Abhiseka) of Heavenly Turning Wheel. If the breath comes out of his mouth touches the body of another person, the person who is touched will arouse merciful mind and become free from the poison of anger, will become a non-retrograde Bodhisattva, and attain Anuttara-samyak-sambodhi quickly. If the person, who wears and holds this Dharani, touches the bodies of others with his hand, those who are touched will attain the stage of Bodhisattva quickly. If the person who wears and holds this Dharani, sees any men, women, boys, girls, and even the sentient beings of other forms, those who are seen will all attain the stage of Bodhisattva quickly. Such a person will never suffer from the affliction of birth, aging, illness, death, or the affliction of being separated from the persons or things that he loves, and will gain the unimaginable correspondences by the mindfulness and reciting. Now, these are the consequences of the Six-Words-Great-Enlightening-Dharani."